I presented a poster on May 14-15 at the 2014 BIO World Congress on Industrial Biotechnology, summarizing the regulation of industrial biotechnology in several countries and regions around the world. You can find the poster here on my SlideShare site. The poster presents very brief summaries of relevant regulations in several important countries and global regions that might affect the use of genetically modified microorganisms, algae or plants for the production of biofuels or bio-based chemicals. Regulatory regimes are described for three industrial approaches: contained use of microorganisms in fuel or chemical manufacture; open-pond use of algae or photosynthetic bacteria to produce fuels or chemicals; and the field testing and commercial cultivation of transgenic plants as feedstocks. This is the third of a series of blog posts providing further detail on some of the regulations discussed in the Poster. The first post covered North America. The second post covered Brazil, the European Union and South Africa. Today’s post covers several Asian countries and Australia. Japan is a signatory to the Cartagena Protocol, and it has adopted Law 97 of 2003, entitled “Law Concerning the Conservation and Sustainable Use of Biological Diversity through Regulations on the Use of Living Modified Organisms.” This law placed Japanese law in conformance with the Protocol, and forms the basis for Japan’s biotechnology regulatory regime. Among the defined terms of Law 97 are definitions of two categories of use of Living Modified Organisms (LMOs). “Type 1” Uses correspond to what is typically called “deliberate releases”, while “Type 2” Uses are “contained uses”, which are both defined in Article 2 of the Law. Contained manufacturing: Under the biotechnology laws, contained uses of modified organisms are regulated as “Type 2” uses: the Ministry having jurisdiction may vary, and could be either the Agriculture Ministry or the Environment Ministry. For more details on this regulatory regime, please see my prior post of September 27, 2013. Open Ponds and Transgenic Plants would be regulated more stringently as “Type 1” uses. According to the most recent USDA GAIN report, four ministries are involved in regulation of the commercialization of genetically modified plant products: the Ministry of Agriculture, Forestry and Fishes (MAFF), the Ministry of Health, Labor and Welfare (MHLW), the Ministry of Environment (MOE), and the Ministry of Education, Culture, Sports, Science and Technology (MEXT). However, transgenic energy crops would not be used for food purposes and would not require the same level of scrutiny given GMO crop plants in Japan, and presumably MAFF would have the lead in conducting risk assessments of proposed field tests and ultimately commercial use of transgenic energy crops. According to the GAIN Report, over 120 “events” in 8 crops have been approved for environmental release. Presumably these are all food crops (but none have been approved for commercial cultivation), although there has apparently been an approval for commercial growth of a modified rose plant. Discussion of the regulation of contained uses can be found in a post of March 26, 2013. Further discussion, including an overview of the regulation of open-pond uses, can be found in the post of September 27, 2013. Contained manufacturing and open ponds: Under China’s Biosafety laws and regulations, open-pond use of modified microorganisms would likely require approval from the Agriculture Ministry. Jurisdiction over contained uses is less certain, although approval would be needed to import LMOs into China for any purpose. Please see the post of September 30, 2013 for a discussion of how contained and open-pond uses of microorganisms would be regulated in China. The biotechnology regulatory environment for agriculture is outlined in State Council regulations “Food and Agricultural Import Regulations and Standard” and “Agricultural Genetically Modified Organisms Safety Administration Regulations 2001” and implemented by MOA under Ministerial Decrees 8, 9 and 10. Other decrees (Measures on the Safety Evaluation Administration of Agricultural Genetically Modified Organisms, Measures on the Safety Evaluation Administration of Agricultural GMO Imports, and Measures on Agricultural GMO Labeling Administration govern domestic approval, import approval, and labeling, respectively. The State Forestry Administration has also released its Review and Administration Measures on Conducting Activities Related to Genetically Engineered Forestry Wood Products. English translations of some of these regulations and decrees can be obtained from the MOA website, or in some cases are included in earlier USDA GAIN reports. However, much of these regulations are geared towards the food uses of transgenic plants, and so would likely be applicable to biofuel feedstocks only as they apply to field testing and commercial cultivation. In any event, there have been a considerable number of transgenic plant varieties approved for field testing in China, as well as some approvals for commercial cultivation of GMO crop plants. Contained manufacturing: Malaysia ratified the Cartagena Protocol on Biosafety in September 2003 and adopted a Biosafety Law in 2007, along with regulations under this Law in 2010. The law created the National Biosafety Board (NBB) within the Ministry of Natural Resources and Environment, which must be notified before using or importing LMOs in contained manufacturing. The NBB is an inter-ministerial body which reviews biotechnology applications, with scientific expertise provided by the Genetic Modification Advisory Board (GMAC ). From the country’s Biosafety Clearinghouse website, it appears that there have not been any prior approvals for contained commercial use of genetically modified microorganisms. Open Ponds and Transgenic Plants: The NBB’s Genetic Modification Advisory Committee must approve releases of LMO plants and microorganisms into the environment. Although there are several varieties of GM crop plants which have been approved for commercial use in Malaysia (modified corn and soybean, imported from outside the country), none of these can be grown in the country. The NBB has apparently approved only one confined field test of a genetically modified plant, a transgenic papaya which was approved in 2013. More information on the status of transgenic plant regulation in Malaysia can be found in the most recent USDA GAIN Report on this country. Contained manufacturing: Indonesia has ratified the Cartagena Protocol, and adopted Law Number 21 of 2004, followed by Government Regulation Number 21 of 2005, to implement its responsibilities under the Protocol. These regulations appear to require an environmental risk assessment for the importation into the country of any GMO, even for contained use. The gist of the regulations is that any GMO either created in the country or imported into Indonesia must undergo a risk assessment to ascertain environmental safety, food safety, or animal feed safety. The Ministry of Environment appears to be the main contact for GMOs, and is listed with the Cartagena Protocol as the “Competent National Authority”. In addition, Law 21 required the formation of a Biosafety Commission of Genetically Engineered Products (Indonesian acronym KKH), which is assigned to assist relevant agencies in giving recommendations about biosafety, in conducting control over importation and use of genetically engineered products, as well as in the scientific evaluation of applications and reports. Please see my post of March 26, 2013 for a discussion of the regulation of contained uses of microorganisms under the biotechnology law. Open Ponds and Transgenic Plants: Outdoor uses of modified plants or microorganisms would require approval by the Ministry of Agriculture, following review by the KKH. The process for review of proposed field testing and commercialization of transgenic plants in Indonesia is described in the most recent USDA GAIN Report. According to this report, a number of modified crop plant varieties have been approved for confined field testing, but none so far have been approved for commercial use. The Ministry of Agriculture has issued Regulation No. 61/2011 on the procedures of testing, evaluating, releasing, and withdrawing of GE plant varieties, and the GAIN Report says that this has sped up the approval process, by including aspects of the environmental safety approval processes and the field trials for GE crops. Australia has one of the more developed biotechnology regulatory frameworks in the world, through the Gene Technology Act of 2000, which has been implemented by the Gene Technology Regulations of 2011. Under the Gene Technology Actand its regulations, both contained and non-contained uses of LMOs would require a license from the government, through the Office of the Gene Technology Regulator (OGTR). The Australian law uses the terminology “dealings” to refer to any proposed use of a genetically modified organism. The application forms and other information required for compliance with the Law can be found on the website of the OGTR. Contained uses of microorganisms would be considered as “dealings not involving release” (DNIR). Although such uses require government review and approval, in general such proposals would face a shorter, easier approval process than would a proposal for outdoor uses of GMOs. As of this writing, Australia has granted over 500 DNIR licenses, and although the great majority of these have been granted to academic institutions for research projects, there are a number granted to for-profit companies for various commercial purposes. However, none of these appear to be related to biofuel or biobased chemical production. The list of DNIR licenses can be accessed from the OGTR website. Open-pond uses and transgenic plants would be regulated by OGTR as “dealings involving release” (DIR). These proposed uses would be subject to greater scrutiny and a more involved risk assessment than DNIR applications, but the Australian government has approved a significant number of these applications. The list of granted DIR licenses can be found here. It appears that all the approved licenses have been for transgenic crop plants or for genetically modified vaccines, and none appear to cover either modified energy crops or modified algae or microorganisms. A discussion about the regulation of contained uses of microorganisms in Australia can be found in a post of March 26, 2013, with additional discussion of how contained and open-pond uses of microorganisms would be regulated in Australia in a post of October 2, 2013. I’ll be presenting a poster on May 14-15 at the 2014 BIO World Congress on Industrial Biotechnology, summarizing the regulation of industrial biotechnology in several countries and regions around the world. You can find the poster here on my SlideShare site. The poster presents very brief summaries of relevant regulations in several important countries and global regions that might affect the use of genetically modified microorganisms, algae or plants for the production of biofuels or bio-based chemicals. Regulatory regimes are described for three industrial approaches: contained use of microorganisms in fuel or chemical manufacture; open-pond use of algae or photosynthetic bacteria to produce fuels or chemicals; and the field testing and commercial cultivation of transgenic plants as feedstocks. This is the second of a series of blog posts providing further detail on some of the regulations discussed in the Poster. The first post covered North America. Today’s post covers Brazil, the European Union and South Africa. Under the National Biosafety Law, all proposed uses of living modified organisms would require approval from the Biosafety National Technical Committee (CTNBio), followed by authorization from the applicable Ministry. CTNBio is part of the Ministry of Science and Technology, and it is a multidisciplinary committee composed of representatives from many different ministries and branches of the government, which is responsible for the technical reviews of biotechnology applications. Responsibility for formulation and implementation of the National Biosecurity Policy falls to the National Biosecurity Council (CNBS), which reports to the Presidency of the Republic. Once CTNBio grants an approval for a project, the formal authorization is granted by a government ministry: either the Ministry of Agriculture for most agricultural activities; the Ministry of the Environment for nonagricultural activities taking place in the environment, or the Ministry of Health for “human and pharmaceutical uses”. Note however, that the approvals for contained uses of LMOs for biofuel production have been issued by the Ministry of Health (see my previous post of February 20, 2014). 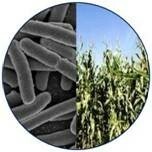 There have been previous approvals for contained industrial uses of LMOs and transgenic plant field testing. Brazil has seen a significant amount of activity in the field testing and commercialization of transgenic varieties of several agriculturally-important species. Approvals for field tests must be obtained from CTNBio, and then receive the authorization of the Ministry of Agriculture. More information on the status of transgenic plant regulation and field testing in Brazil can be found in USDA GAIN’s 2013 Annual Report on Brazilian biotechnology. Regulations affecting the use of modified microorganisms in contained manufacturing have been described in a post of March 18, 2013, with additional information on open-pond uses in a post of September 26, 2013. I also recently commented on recent approvals for contained manufacturing with modified microorganisms on February 20, 2014. Under the Genetically Modified Organisms Act of 1997, as amended in 2006, permits are needed from the Agriculture Ministry for the importation, contained use, and environmental use of LMOs, including the field testing and commercial use of transgenic plants. Applications must be made to the Registrar of GMOs within the Agriculture Ministry, and there is a website that is the gateway to downloading all the different permit applications that may be required. An Advisory Committee conducts risk assessments, and an Executive Council makes the final decisions. It appears likely that applicants wishing to use an LMO for contained manufacturing in South Africa would need to file applications to allow the importation of the organism, the registration of the facility, and to approve the proposed commercial use. Companies planning field tests of transgenic plants in the country would need to file similar applications as well as obtaining approval for the field tests themselves. You can find a little more detail about the regulations affecting the use of modified microorganisms in contained manufacturing in a post of March 18, 2013. The EU has adopted two directives to cover biotechnology – one covering contained uses of modified organisms, and the other covering uses of modified plants and other organisms in the open environment. Each EU member state is obligated to adopt national laws corresponding to EU directives, and so all 28 EU members should have their own biotechnology laws or regulations that mirror the provisions of the two EU directives. Therefore, for activities in any EU member state, relevant approvals would be needed under national laws corresponding to the EU Directives. Contained manufacturing: Contained uses of modified microorganisms would require national government notification, and in some cases possibly also approval, in accordance with the EU “Contained Use” Directive 2009/41/EC. Article 2 of the directive defines “contained use” in a way that gives an applicant proposing to use a GM microorganism in Europe a fair amount of leeway in determining that a system or process is “contained”. Article 4 of the directive requires the user to carry out a risk assessment of the microorganism, using considerations set forth in Annex III of the directive. As a result of this assessment, the user would determine which of four containment levels is appropriate for the organism, after which the user would have the requirement to adopt appropriate containment measures in accordance with Annex IV of the directive. These requirements are similar to most other international biosafety guidelines, and most microorganisms used for fuel or chemical production would qualify to be included within the lowest level of containment. Article 6 of the directive requires users to notify the government agency designated in national legislation as having jurisdiction to enforce the contained use directive before a facility is to be used with GMMs for the first time. Annex V specifies the information required to be submitted with such notifications, and for organisms in the lowest class of risk, the necessary information is fairly minimal. The laws of individual EU nations should conform to these provisions, and in most cases there would not be any need to seek government approval for contained uses, beyond the notifications described here. Uses of modified microorganisms in open ponds and the field testing and commercialization of transgenic plants would be covered by national laws corresponding to EU Directive 2001/18/ECon “Environmental Release”. Generally speaking, any outdoor activities with LMOs in Europe, including small scale field testing, would require approval from the country in which the activity is to take place. Applications for commercial use are more complicated, in that all EU member states have some say in commercial approvals granted by individual countries. Although most if not all EU members have approved numerous field tests of transgenic plants over the past two decades (most of which have been for food-producing crops), commercial approvals for food crops have proven extremely problematic, and at times have effectively been barred in Europe. It remains to be seen if the use of a modified non-food-crop plant species as a biofuel feedstock would generate the same level of controversy in Europe as has some transgenic food species. The EU Biotechnology Directives have been described in a post of July 12, 2010 (which includes information on transgenic plant regulation),with additional information in a post of March 26, 2013. A further update, which includes a discussion of the applicability of the directives to open-pond uses of modified algae, can be found in a post of September 23, 2013. This is the first of a series of blog posts providing further detail on some of the regulations discussed in the Poster. Today’s post covers North America: Canada, Mexico and the U.S. Contained or Open Pond uses of modified microorganisms may require Environment Canada approval under the New Substances Notification regulations under the Canadian Environmental Protection Act. These regulations cover the use of any microorganism that is new to commercial use in Canada, and potentially cover many modified microbial strains as well as unmodified microorganisms that have not previously been used in Canada. The regulations potentially cover both contained and open-environment use of microorganisms, with a greater level of scrutiny dedicated for the latter, however, as of this writing the only microorganisms approved under the program have been for enzyme manufacture or other uses not related to biofuels. See the posts of March 18, 2013 and September 19, 2013. Novel Plant Feedstocks: The Canadian Food Inspection Agency regulates “confined” and “unconfined” releases of plants with novel traits (“Confined” releases are field tests with controls to prevent potential spread of the modified plants or their pollen; “unconfined” releases are larger-scale or commercial releases of novel plant varieties). See the post of July 9, 2010 for a description of Canada’s regulatory regime for novel plants. As would be expected, most of the approved field releases and all of the commercial approvals have been for modified varieties of common agricultural crops, but the Canadian company Linnaeus Plant Sciences has received a number of approvals for confined field testing of Camelina lines with modified oil composition, which the company is developing for fuel or chemical use. Contained manufacturing: Most contained uses of modified microorganisms would be regulated by EPA under TSCA (40 CFR Part 725) and would require filings of Microbial Commercial Activity Notices (MCANs). These regulations would cover proposed industrial uses of “intergeneric” microorganisms used for purposes such as biofuel or bio-based chemical manufacture. I have written about these regulations in quite a few posts going back to the inception of the blog in 2010. Detailed information on the EPA regulations can be found in a series of posts beginning on April 21, 2010, with a more recent summary on September 17, 2013. Other posts on the blog have described specific MCAN filings and other TSCA-related issues. 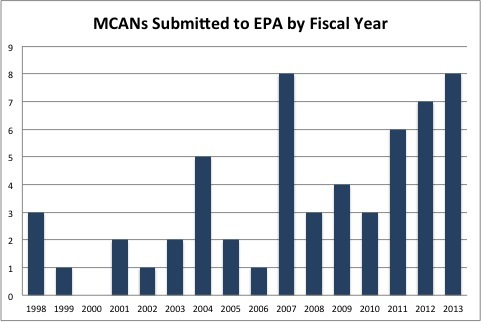 Numerous MCANs have been reviewed by EPA in recent years for microorganisms modified for improved biofuel production, and overall the number of MCAN filings has risen in recent years (see Figure). Source: EPA website and other sources. Under EPA’s TSCA regulations, open pond uses of genetically modified algae for research purposes would require EPA review and approval of TSCA Experimental Release Applications (TERAs) with ultimate commercial use requiring MCAN filings. I have discussed the TERA process and some recently filed TERAs, including the first approved TERAs for open-pond research using genetically modified algae strains, in posts of November 1, 2013, November 4, 2013 and December 19, 2013. Feedstocks: Field testing and use of transgenic plants as biofuel feedstocks would be subject to the biotechnology regulations of the U.S. Department of Agriculture that have been used since 1987 to regulate the agricultural biotechnology industry (7 CFR Part 340). Although gaining approval under these regulations for commercial use and sale of transgenic food-crop plants has become a lengthy and sometimes controversial process, the regulatory regime as a whole has been quite successful in allowing transgenic plants to be field tested and moved towards commercialization, and should be straightforward for biofuel feedstock developers to comply with. See the series of posts beginning with May 18, 2010. Field tests have been conducted in the U.S. on plants and trees modified with traits that might make them more useful as biofuel feedstocks, including such species as switchgrass, Miscanthus, and Camelina. CIBIOGEM, an Inter-Ministerial commission, coordinates oversight activities under Mexico’s Biosafety Law. Under the Law, uses of modified microorganisms in contained manufacturing would require review and approval, likely by the Environment Ministry SEMARNAT. The regulation of the use of modified microorganisms in contained manufacturing has been described in a post of March 18, 2013. The possible outdoor use of modified algae in open ponds or the field testing or commercial use of transgenic plants as biofuel feedstocks must be approved Under the Biosafety Law by the Agriculture Ministry SEGARPA. With regard to transgenic plants, there has been considerable activity in Mexico in the field testing of transgenic varieties of agriculturally useful species. Hundreds of field tests and several commercial approvals for transgenic varieties have taken place in Mexico, although these have all been limited to five agriculturally-important species like corn, cotton and wheat. The regulatory apparatus for review of field uses of transgenic plants by SAGARPA seems to be well-established. A good recent description of the Mexican biotechnology regulatory regime and recent field testing activity can be found in the USDA GAIN Service’s 2013 annual report on Mexican biotechnology.